Most of you probably have already realized that the biggest thing we all struggle with our drivers is getting the clubface square at impact. Most beginners will leave the clubface open (pointing to the right of target for a right-handed golfer) at impact. This results in a slice and loss of distance. 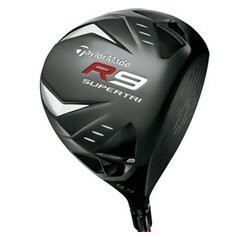 This TaylorMade R9 Supertri allows you to tinker with the position of the clubface. It has TaylorMade's Flight Control Technology (FCT). FCT will give you up to 75 yards of right/left variance, 3 degrees of variance in launch angle, and a 1,500-rpm difference in spin. Plus, you have movable weights that help you adjust the center of gravity. In plain English, beginners and mid-handicappers can adjust the clubface to a closed position to help get the driver face square at impact. My good buddy Brian bought an R9 this year and, after adjusting the face, he went from hitting a high fade on average of 230 yards to a straight ball that draws a little and averages 250 yards. If adjusting the face seems overwhelming, don't sweat it -- because you can take the club into any pro shop or golf shop, and one of the pros can help you adjust the club for your swing. Finally, don't forget: as you improve, you can always adjust the club back to neutral, or for you low handicappers that are fighting a hook, set the clubface to open.